Family Ranch Programs for Struggling Boys The folks who run the Triangle Cross Ranch have a long tradition of helping troubled boys by showing them how to become responsible young men. They are able to do this at family ranch programs, where struggling teens are put to work on a 40,000 acre cattle ranch near Yellowstone National Park. These teenagers may not know a lot about livestock or working on a ranch, but laboring from sunrise to sunset will give a person an appreciation for life like nothing else can. It’s also pretty cool that they get to have an authentic western experience. 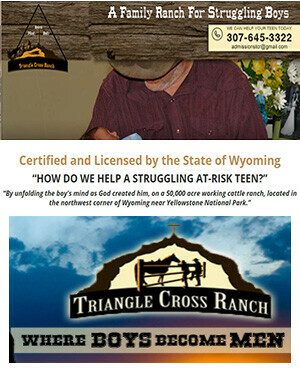 The Triangle Cross Ranch offers family ranch programs for struggling young men on a working ranch in the Beartooth Mountains. Call (307) 213-7116. for information on how this might help your child. For over 22 years troubled young men have been coming to the Triangle Cross Ranch from all across this country. During that time the family that runs it has learned a thing or two about these guys. They believe most are good kids; they just need to be reminded that there are better ways to behave. And even though the ranch is not run under the auspice of the Catholic Church, the family uses their traditional Catholic beliefs, along with a unique healing approach that instills Christian values, in guiding these young men through the healing process. When a participant joins the program, he and his family become joint owners in livestock that is on the ranch. The purpose of this mini-agribusiness is to teach personal responsibility for a living thing other than oneself. It also creates a need to develop better relationships with family members as they work together to see that the business succeeds. This ownership gives the boy a rewarding opportunity to mature with joy and dignity; nothing encourages change and growth quite like seeing one’s own work bare fruit. If you are intrigued by the working ranch philosophy, mixed with healing methods based on Christian values, please contact the Triangle Cross Ranch to learn more by calling us at (307) 213-7116. We know a lot about troubled youth, and we know a lot about the things that give will give your son the best chance to change their ways.